If the vehicle has hydraulic brakes, pump the brake pedal three times. Then apply firm pressure to the pedal and hold for five seconds. The pedal should not move. If it does, there may be a leak or other problem. Get it fixed before driving. If the vehicle has air brakes, do the checks described in sections 5 and 6. Allow vehicle to move forward slowly. If it doesnʼt stop vehicle, it is faulty; get it fixed. “Pulling” to one side or the other can mean brake trouble. Any unusual brake pedal “feel” or delayed stopping action may mean trouble. Set electric brake to maximum sensitivity (dial or box). Drive forward, step on brakes. Trailer brakes should engage before power unit brakes. If you find anything unsafe during the pre-trip inspection , get it repaired immediately. Federal and state laws prohibit operating an unsafe vehicle. If you see, hear, smell or feel anything that might mean trouble, check it out. 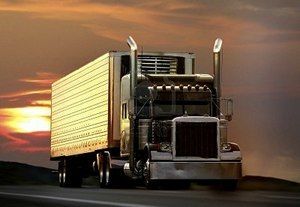 Drivers of trucks and truck tractors when transporting cargo must inspect the securement of the cargo within the first 25 miles of a trip and every 150 miles or every three hours (whichever comes first) afterward. You may have to make a written report each day on the condition of the vehicle(s) you drove. Report anything affecting safety or possibly leading to mechanical breakdown. The vehicle inspection report tells the motor carrier about problems that may need to be fixed. Keep a copy of your report in the vehicle for one day so the next driver will be aware of any problems you have found. There may be a question on checking load securement. Make sure you memorize that loads need to be checked within the first 25 miles and then again every 150 miles or every three hours, whichever comes first. Remember: You must perform a vehicle inspection daily. A pre-trip inspection is a thorough inspection of the truck completed before driving for the first time each day. Federal and state laws require that drivers inspect their vehicles. Federal and state inspectors also may inspect your vehicles. If they judge a vehicle to be unsafe, they will put it “out of service” until it is repaired. When checking hydraulic brakes, you should pump the pedal three times then apply firm pressure and hold for how many seconds? If you find anything unsafe during the pre-trip inspection, get it repaired immediately. Federal and state laws prohibit operating an unsafe vehicle. At what speed should you test your service brakes? - Go about 5 mph. - Push brake pedal firmly. - "Pulling" to one side or the other can mean brake trouble. - Any unusual brake pedal "feel" or delayed stopping action may mean trouble.